Evidence that global warming is a Chinese hoax: They make all our thermometers. In my youth i had goals. No no, not to Make Something of Myself, since i was realistic enough to abstain from aspirations of any real success. Even so, i never attained any goal i’d set, and it was pure accident that i blundered into the employee stock purchase program at Oracle that was the only good investment i ever made. So at some point along there i stopped setting goals. How foolish, i’ve realized. So i’ve come up with a reasonable compromise: attainable goals. I now have two. The first is to see a total eclipse of the sun. This is doable because for the first time in my life one will occur within a reasonable distance. I’ve made motel reservations in Springfield, Oregon for the night of 20 August and will get up the next morning, drive 60 miles north to the exact center of the eclipse path, and sit there taking photos and wallowing in the experience. Why down in Springfield? Because by the time i got around to reserving a room, every hotel for some distance along the middle of the eclipse path on either side of I-5 had been booked solid. Better yet, on the way up to Oregon i’ll make stops in northern California to get photos of the bridges over the Sacramento River that i missed on my last expedition up there. And finally, since i’ll be in Oregon, i’ll photograph as many as possible of the bridges over the Willamette River between Eugene and just south of Portland. I already have those in Portland and a handful in Eugene. My second goal is to hang around until October so i can see Ridley Scott’s sequel to Blade Runner, it being perhaps my favorite movie. How’s that for achievable goals? 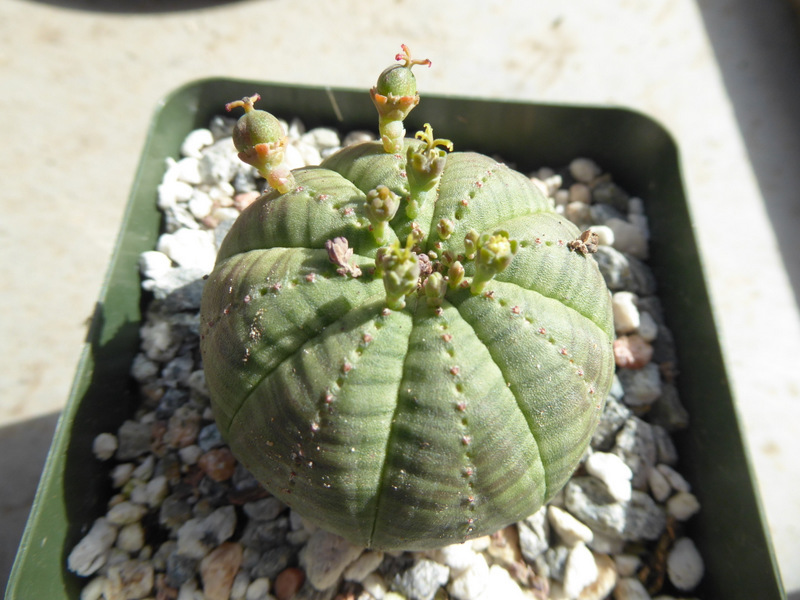 Meanwhile, i wrote last month about getting little starts of Euphorbia obesa and determining when the second bloomed that i had, as hoped, a male and a female. Well, they’re just teenagers, but they’re old enough that he was able to fertilize her. Check out the two babies. Wow! Food for thought…goals! Will be anxious to see the photos! We’ll be so close for the eclipse! DO your proper research into what eyegear to wear! Thanks for your concern, and i bought my “sunglasses” from a link provided by NASA.